I know not everyone enjoys staring at spreadsheets as much as I do but data can be a powerful tool in addressing problems in local NHS abdominal aortic aneurysm (AAA) services. We have developed a new report for local use to better understand the population eligible for screening and improve services to meet their needs. This report highlights inequalities in AAA local provider areas and will also help provide evidence of the quality of services local providers deliver. We know, for instance, that men living in more deprived areas are less likely to attend screening and are more likely to have an aneurysm. To address this kind of inequality we’ve developed a report for local programmes that shows where this inequality of uptake occurs in their programme. We are challenging providers to increase uptake in the most deprived areas by 10% by the end of 2018 to 2019. I know what you’re thinking, this all sounds like a great idea but it's probably all too hard to do. Right? Wrong! Of course, always remember that AAA screening is an individual choice rather than a recommendation. Saying that, people can only make a choice that is right for them if they have access to high quality, evidence-based and accessible information. That is something this tool and videos will help you with. I’ll be sending local AAA programme managers the tool when the reports are available later in October. It enables programmes to easily summarise data from the report in to tables and charts. You’ll also be able to access it on GOV.UK in early 2018. These videos are available to use whenever is convenient and users can go back to them as often as they need. We will be developing another set of videos that cover the ethnic group section of the report ready for the next data release in January 2018. If you have any questions, please comment on this blog or in our feedback survey. 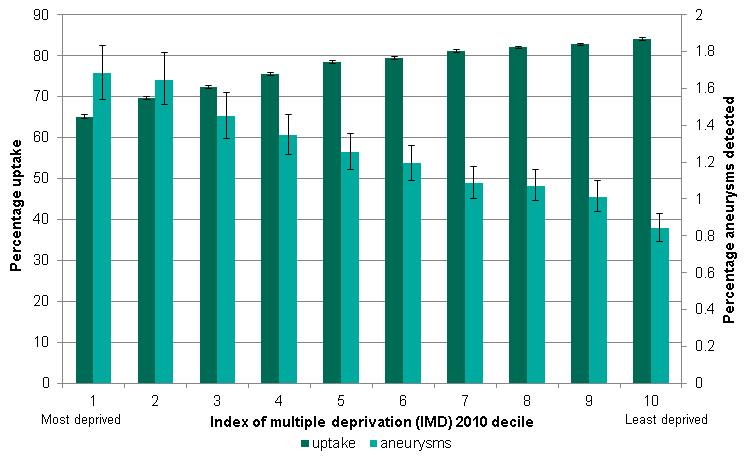 so isn't the higher rate of aneurysms going to be driven more by smoking than the deprivation score? I've skipped through the videos and can't see a mention of smoking. Of course this also means that women who smoke are at higher risk of AAA then men who don't smoke...... women smokers are screened for AAA in USA I think.